Brookhaven Republican chairman Jesse Garcia said the break-in attempt was made between 1 and 2 a.m. Tuesday. Campaign workers had left around midnight. Suffolk police said Tuesday they were investigating an attempted break-in at Brookhaven Town Republican Committee headquarters in a Medford office complex where two other burglaries occurred. Police said medical, real estate and the GOP offices at 3080 Rte. 112 were targeted. An unspecified amount of cash was taken from the real estate office, police said. Nothing was missing from the doctor's office, and the attempted burglary at Republican headquarters was unsuccessful, police said. 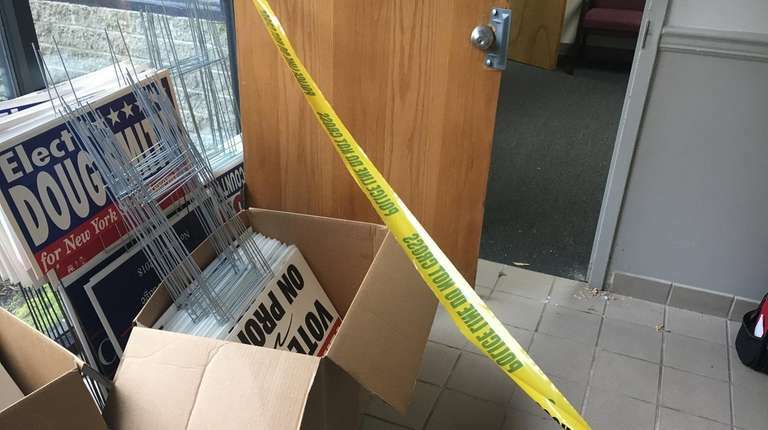 "A door to the Brookhaven Town Republican Headquarters was damaged but no entry was made," police said in a statement. Brookhaven Republican chairman Jesse Garcia said the burglary attempt was made between 1 and 2 a.m. Tuesday. Campaign workers had left the building around midnight, he said. He said campaign flyers and party computers are stored at the office. In a statement, Garcia said he did not consider the attempted burglary a random occurrence. Suffolk Democratic spokesman Keith Davies said the party had nothing to do with the burglary attempt.